So, last night something amazing happened! A band came to Anchorage Alaska. A good band! Perhaps this doesn't sound very exciting to most of you, but bands never come to Alaska. Like. NEVER. I'm not kidding. It's amazing we even have any music scene whatsoever. We make do with our local bands though. So, anyway, I got to go to a sold out Cold War Kids show! It was incredible. I went with my good friend Rebecca,and we had a blast. Good beer, better music, and walking through the crowd with people whispering, "is that Zooey Deschanel?" "That girl looks just like Zooey Deschanel!" Haha! It was funny too, it was like all the hipster cool kids all appeared out of nowhere. I wonder where they all hibernate when the Cold War Kids aren't in town. I'm guessing coffee shops? I'm a shut-in, so I never know where people hang out. I'm slowly figuring out the cool places to go in this hometown of mine. Look at this necklace. Just look at it! Every time I wear it I get that warm fuzzy feeling inside me that nerds get when they get an autograph from Leonard Nemoy. Oh wait, I am a nerd (you're officially a nerd when the number of Star Trek conventions you've attended is more than zero). 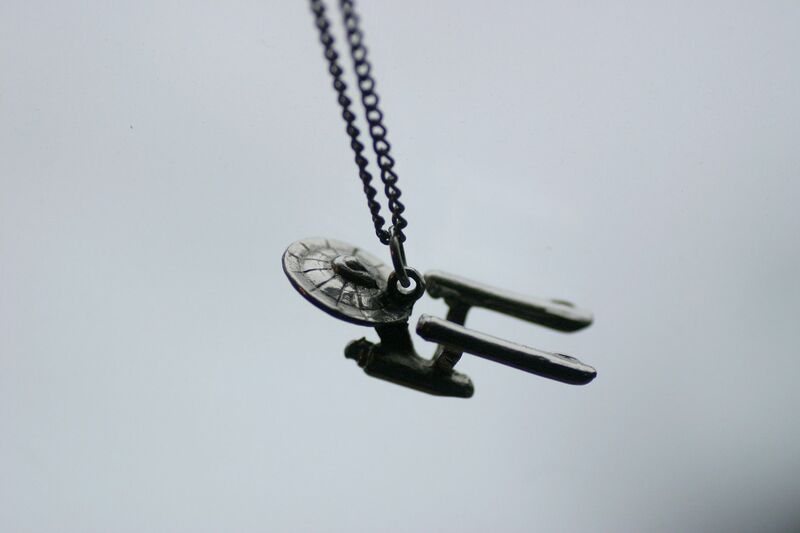 This is a vintage Star Trek Enterprise necklace from 1976. I think it's my favorite necklace of all time. More exciting things! 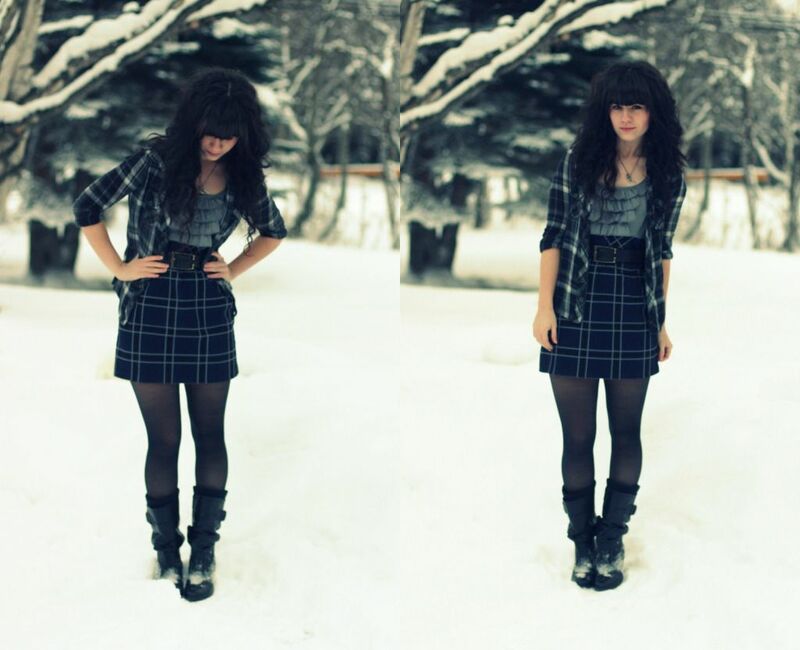 I got this dress in the mail yesterday from Mel! I was so excited that I immediately put it on and then decided I just had to wear it to the Cold War Kids show. I love the cute ruffles on the front! 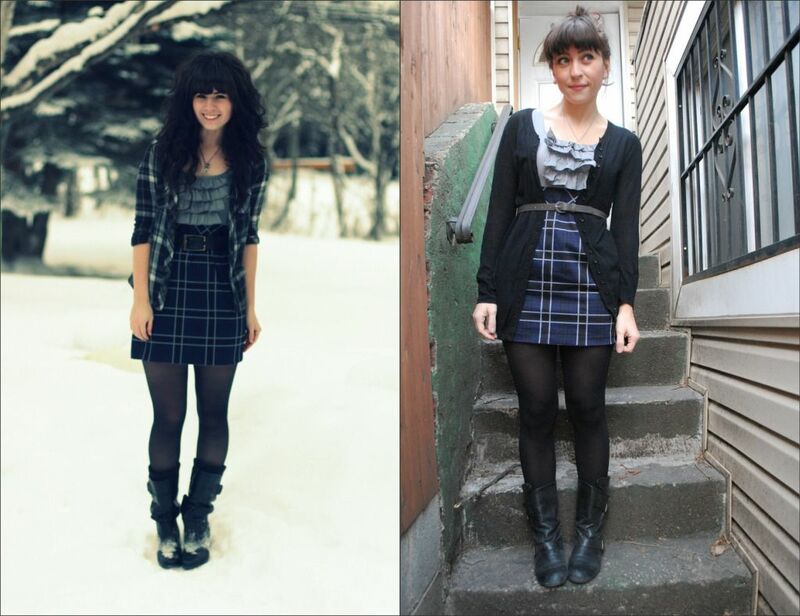 Looking at how I styled it next to Mel I think I ended up styling it very similarly to her! Black boots, Black nylons, belted. Haha. I can't wait to see how the other girls style this dress!